Bristol Cycling Campaign member David Neale has produced another excellent and well worked out proposal (see also the Barrow Hospital plans). 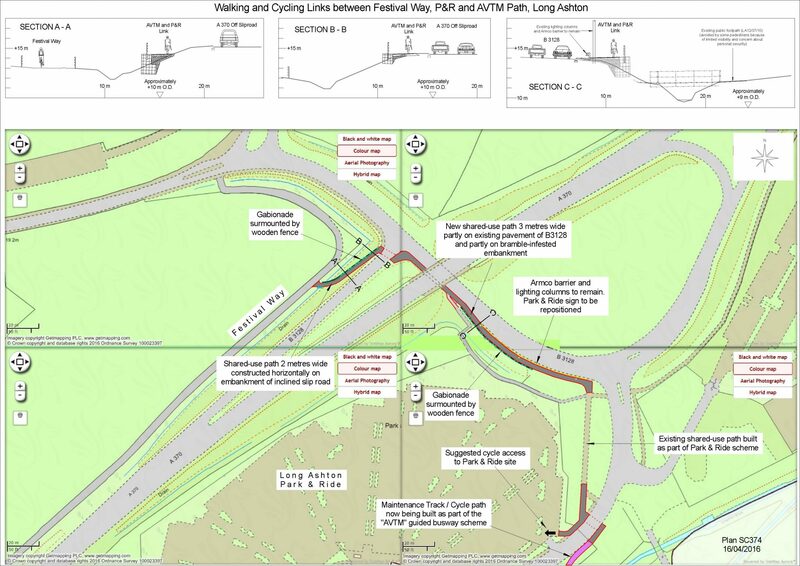 This one will provide a traffic-free walking and cycling link in Ashton Vale between the AVTM maintenance/cycle track, the Long Ashton P&R and Festival Way (AVTM is the Ashton Vale to Temple Meads part of MetroBus). With the likelihood of more traffic congestion when the South Bristol Link road opens, the scheme should benefit increasing numbers of pedestrians walking between Long Ashton village and the Park & Ride. Note that it connects to the new spur connecting the park and ride to the South Bristol Link shared use path. 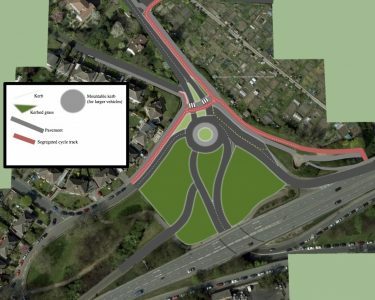 The plans were presented to the North Somerset Cycle Forum in April 2016. We hope this useful link can be part of future funding bids. Did you know that Gloucester Road was one of Bristol’s busiest cycle routes (Building on success – lessons from Gloucester Road)? What’s more, the number of people cycling has doubled in the last ten years whereas motor vehicle numbers have dropped by a fifth. These facts can be seen from Department for Transport Traffic Counts. So what does this tell us? 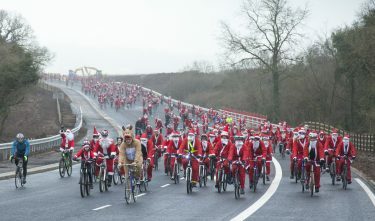 Bristol’s Cycling City money has been well spent? Not quite. 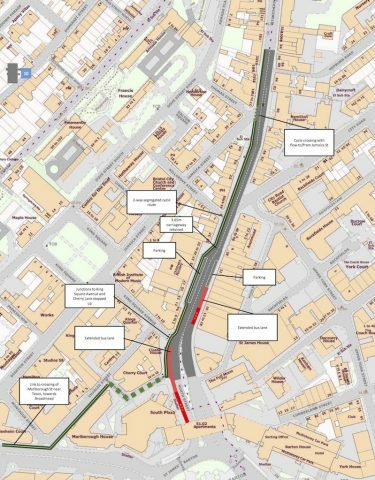 Significant Cycling City money was not spent on Gloucester Road infrastructure as the end of project report makes clear. In fact people on bikes are using this route despite, not because of, its facilities for them. As anyone who has cycled into, or out of, the City on Gloucester Road knows the only “cycling infrastructure” is, essentially, paint and bus lanes. And bus lanes are for both a human on a bike (100 kilos) and a double decker (15 tons) – hardly fair or equal! St James Barton roundabout remains among the worst in Bristol for cyclists. This is despite the sterling work of The Bearpit Improvement Group and the recently completed £1million scheme to provde a route around the inner edge of the roundabout at street level for pedestrians and cyclists. We hope this already outdated scheme will be the last time huge budgets will be spent forcing cycles to share busy spaces with pedestrians (see BCyC Policy on Shared Space Streets and Shared Use Pavements). However the omens are not good in Temple Quay. 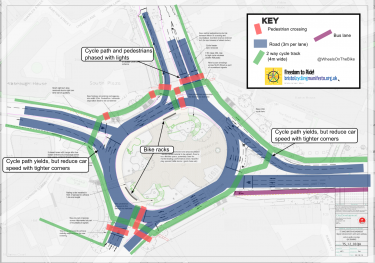 Our modest proposal shows how proper Space for Cycling can be provided on this key roundabout that sits at the centre of the most heavily used routes in the city. Taken with our A Modest Proposal #1: Pedestrianise Clifton Triangle, we can begin to get a sense of how the Inner Loop (A Modest Proposal #3) can be done.